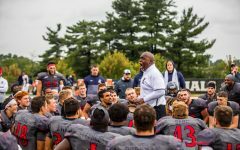 The Robert Morris University Colonials (1-1) won a thriller of a home opener by a score of 22-19 Saturday afternoon versus the Virginia State University Trojans (0-2). 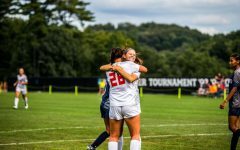 The Colonials overcame the constant showers with Matthew Gonzalez and Warren Robinson each delivering with late-game heroics. 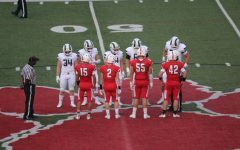 During the first quarter of Saturday’s contest, the offense on both sides struggled to get anything going, each stalling out on their opening drives despite showing flashes of consistency. A muffed punt by the Colonials on the 21-yard line gave Virginia State an opportunity that they were not able to capitalize on, with a missed 27-yard field goal leaving the first quarter scoreless. At the start of the second quarter, Virginia State’s offense was sparked by a pass interference call and a 23-yard pass from Quarterback Cordelral Cook— who capped off the 73-yard drive with a one-yard rushing touchdown, giving the Trojans a 6-0 lead. RMU quickly fired back with a 3 minute 70-yard drive finished by a one-yard rushing touchdown by Mathew Barr, giving the Colonials a one-point lead with the successful extra point. Both teams struggled to get any offense going towards the end of the first half, ending with Virginia State coming closest to points with a 46-yard missed field goal attempt. The weather was an obvious factor during the first half for Robert Morris and VSU, the rain bringing two muffed punts for the Colonials along with a couple of dropped passes. The two offenses were struggling to find a rhythm amid the relentless weather. Although the second half opened up with a Robert Morris punt, the Colonials quickly got the ball back with an athletic interception by Tyler Lamica. 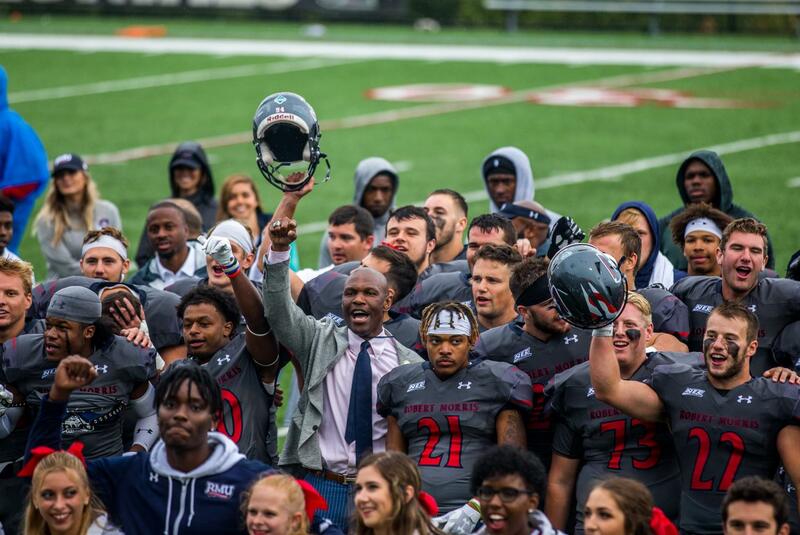 Unfortunately, RMU was not able to capitalize on the turnover and the special team struggles continued with yet another punt return gone wrong, resulting in an RMU turnover leading to a seven-yard rushing touchdown from Demetrius Strickland ending a short field 32-yard drive. The turnover woes continued into the fourth quarter when a fumbled handoff on the RMU goal line lead to a Trojan touchdown making the game 19-7 in favor of VSU. With RMU momentum nowhere in sight, Jimmy Walker connected with Gonzalez for an 81-yard Colonial touchdown (The fifth longest in team history), followed by a perfectly executed onside kick recovered by Thomas Neal. With their newfound momentum, the Colonials were knocking on the door on the 12-yard line, where Walker found Robinson in the corner of the end zone giving RMU the 22-19 lead with a successful two-point attempt off a shovel pass. Virginia State’s final effort came with one second left on the clock when the Trojans attempted to tie the game with a 12-yard field goal which is blocked by Frank Antuono.